This week Awesome Stories brings you enlightened teaching, gratitude, helpful debt, public art and attention. Collaborative and Proactive Solutions (CPS) is the latest teaching method for handling difficult children. It’s based on years of research that shows that punishing children who are disruptive or having problems in school only accelerates the problems. Instead of punishing the kids, CPS creates dialog, understanding and better options for dealing with the challenges. The core of CPS is “meeting the child’s needs and solving problems instead of controlling behavior.” One school that implemented the program dramatically reduced their disciplinary actions and suspensions. The key to effectiveness is training school (or prison or psych clinic) staff to nurture strong relationships and give kids a central role in solving their own problems. Sounds like an enlightened approach to learning to me. In this TED Talk, Brother David Steindl-Rast talks about the connection between happiness and gratitude. As he discusses in his TED Talk, we all want to be happy. He proposes that despite the different ways we define happiness, focusing on gratitude helps build happiness. He offers a simple method for happiness based on learning to be grateful moment to moment. By learning to appreciate the precious gifts offered by life, we become masters of gratitude. He also proposes a revolution of happiness, spread by grateful people taking action to help each other and celebrate life. This article talks about a change in the way debt is viewed and treated in our lives. Traditional debts based on loans to and from institutions often create financial burdens to our lives. Whereas debts based on relationships, often create a circle of giving, growing and helping people. Some people with capital are also working to revise the way debt is used, more as a tool for helping people than a way to make money. Various forms like financial coops, crowdsourcing, pper to peer lending and credit unions have all formed with the idea of helping people as their primary motive. I’d love to see more debt based on helping people or better yet, resources freely shared among people. What do you think? 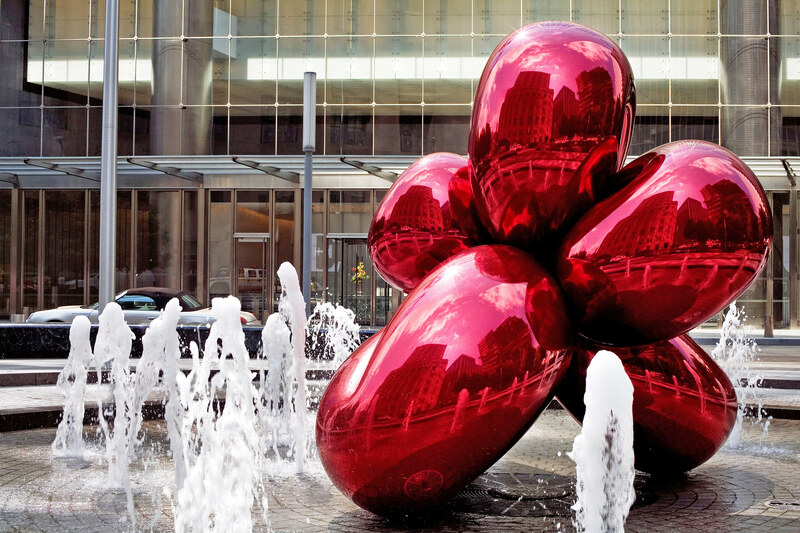 Architectural Digest recently had a slideshow of fascinating public sculptures. My favorite is Les Voyageurs which depicts the way we leave parts of ourselves behind as we travel. I’ve seen the Bean in Chicago. First Generation looks fun as well as the Mustangs. What’s your favorite sculpture? This is an interesting article that suggests changing our attention may be the biggest key to changing behavior. Many of us struggle to make lasting changes in our behaviors. This study is in line with many personal growth teachings that say if we change our focus, we can change our lives. Researchers found that simply offering a choice helps people break their habitual focus and patterns. Then, they are more likely to make new choices that can lead to desired results. Daniel Goleman discusses three types of focus and how they can shape our lives in the video below. May we use our attention to bring more love into the world. LOVE! I did a radio program on which comes first, happiness or gratitude, only last Sunday… ever since I did that, I have come across all these people who share the same thought process.. I don’t agree with everything this man says, for I DO believe that we can find a reason to be grateful for all those things he claims we cannot… To each, our own, eh? Wonderful synchronicity Annette. I’ve found that gratitude and being present and accepting seem to have the great correlation and impact on my happiness. I honor you to find and know what is best for you. I love architecture. I remember taking an elective in college in which just looking at the architecture of buildings told a vivid story about a particular town and how it evolved over time. Personally, my favorite piece is the “Architectural Fragment” in Melbourne, Australia. I love when the blend of architecture and art combine to create a story and set the imagination running wild, which that piece certainly does for me. Thanks, as always, for sharing your awesome stories, Brad! Wonderful Dave. I share a love of architecture and design, feeling a pull toward buildings that blend beauty with good function. Thanks Natalie. I love him and his soothing voice too. His gratitude video is one of my all time favorites!